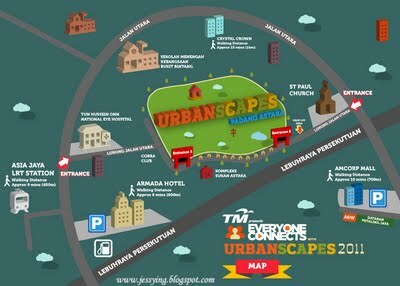 Urbanscapes is a one day event organised by KLue and is the first and only all-day “user-generated” creative arts festival. Urbanscapes aims to bring together communities and participants from the fields of music, arts, lifestyle, film under a single banner to showcase the best of the local scene. The ticket price is RM40, with 1000 early birds tickets released for RM30. And since TM Everyone Connects is our main sponsor and TM’s subscribers get a special price of RM25 when they purchase at the door with a proof of subscription. 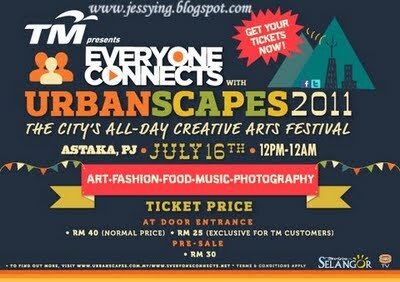 The event will be huge this year and good news to all Jessying's readers is that Urbanscapes going to sponsor 3 pairs of tickets to join Urbanscapes 2011 to have FUN with Art, Fashion, Food, Music & Photography! For more details, please click this LINK.